With this blog post we’ll explore how to use a cane properly. The accompanying video will help you visualize what I’m suggesting. So make sure you take the time to watch it. It’s not that long. When most people think of a cane, the picture that comes to mind is that of what we call a “straight cane” or “single point cane”. Some are adjustable and others (mostly the wooden canes) aren’t. It’s important to make sure that’s it’s properly adjusted to your height. You can tell you’ve got it right if the handle of the cane when you’re standing up the hits you at the bend of the wrist. This is true also if you’re using a walker. As far as using it properly will depend on what leg is hurt/injured/weak. This is what will determine if you’re using it properly or not. The cane is usually used in the opposite hand of the “involved” leg. 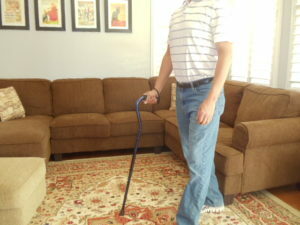 If the left leg is hurt/injured/weak, then you’d use the cane in your right hand. If it’s your right leg that gives you trouble, then use the cane in your left hand. Here’s a very important point: The cane is not meant to lean heavily on. You’re not carrying your weight through the cane. The can is primarily meant for balance and minimal support as you’re walking ( you probably need a walker if you’re tempted to put a lot of your weight through your arm(s)). Another point is to make is that you may see some people carrying their cane. There may be several reasons for this. However, if they are still unsteady, but carry their cane, they also may need to use a walker. The best way to use the cane is to let it rest on the ground with each step you’re taking. Don’t focus on looking at the cane when it contacts the floor. Just let it tap the ground as you’re walking. So, first, you want to determine which leg is the one that’s weak or painful. Next, place your cane in the opposite hand. The reason for that is when we are generally walking using a normal gait cycle the shoulders and the hips move in opposite directions. If you’re stepping with the right leg then the left hand comes forward with it. if you’re stepping with the left leg then your right hand comes forward. With the natural or normal gait cycle your arm swing and leg swing are opposing each other. So, when you use a cane, you want to preserve this normal motion because it helps use keep our balance and move more efficiently. You can tell if someone is using a cane the right way because their walk looks normal. 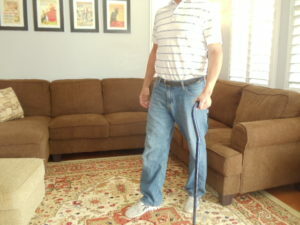 When you see someone using a cane on the same side as their hurt/weak leg, it doesn’t look normal. When you use a cane on the wrong side, it forces the shoulders and hips to rotate in the same direction and this looks abnormal. The following video goes over how you can use a cane properly.